have stumped me. First with papalo and now with this sweet pepper. This was not in the CSA box this week, we just picked it up at the market. John assured us that this was a sweet pepper. But come on! Look at them, they look just like a red hot pepper, maybe an Anaheim or a fresh arbol. So, somewhat dubious, we brought them home. I nibbled the end of one, no heat. So I sliced one and ate a seed. Most of the heat of a pepper is in the pith and the seeds, not the flesh. Still no heat. So this is what we did with them. 8 oz crimini mushrooms, quartered. 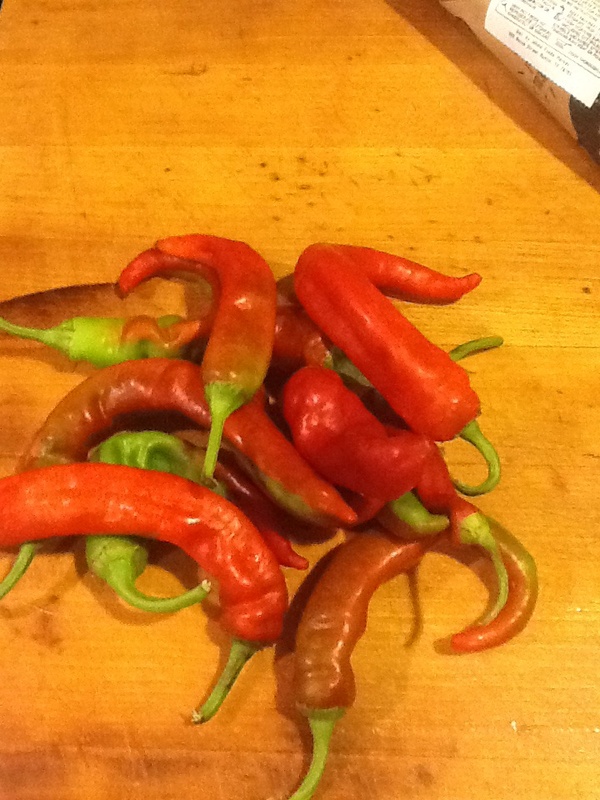 8 oz Nardello peppers, cut in half with the pith and seeds removed. 1 tbsp olive oil. More if necessary. 1/2 cup of red wine. Brown the sausage in the oil in a skillet. Remove, slice, and set aside. Sauté the onions in the same pan until beginning to brown. Remove and set aside. Add the peppers to the pan, try and keep as much of the skins on the skillet bottom as possible so that the skins brown and blister. Add the onions back in and the garlic until they are thoroughly cooked through. Add salt and pepper. Remove everything and set aside. Add the mushrooms and sausage to the pan. Add the thyme. You may need to add a little more oil. Cook covered until the mushrooms are cooked. Add the wine and reduce. Then put back the peppers and onions and cook until the favors meld. Not long. At this point you can leave the dish on a warm stove top, or simmering, covered until you are ready to serve. Correct the seasoning, serve in a large serving dish with a splash of balsamic vinegar. It is great with crusty bread and a green salad. Jimmy Nardello peppers came from Italy in the 19th century. Jimmy Nardello donated them to the Seed Savers Exchange. They are a lovely Italian frying pepper.